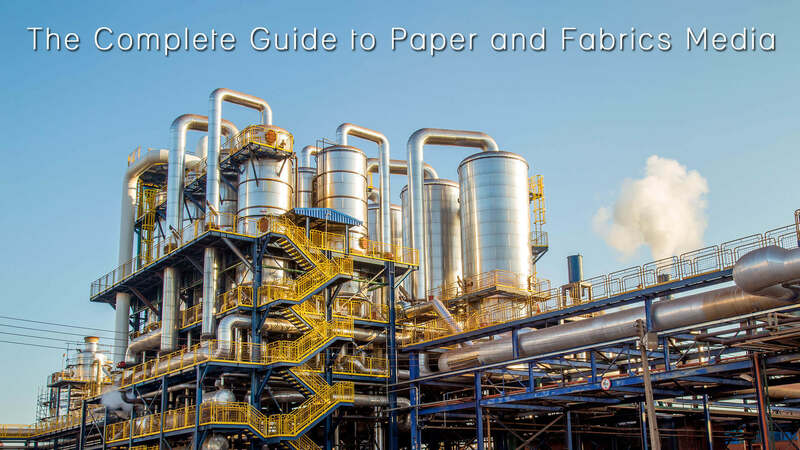 Paper and other fabrics media are the materials that are primarily used for the purpose of filtration, and come in various types. First of these types is the materials that are comprised of fibres of variant sizes and some of them are spun into yarn or individually assembled with no particular pattern. The fibres used for such materials may be derived from natural sources of cotton or wool, or they could be synthetically extracted from a molten 47 polymer. As with any other material, the properties of the finished filter medium closely reflect the properties of the original fibres. The strength of the filter is, therefore, determined by the size of the fibre from which the material is created. The finer the fibre of the original material, the higher will be the filtration strength of the final product with relation to trapping particles. However, there is an inverse relationship between the fibres and the strength of the material created from it. This means that the finer the fibre the less is the strength of the material and it needs to be then supported by a stronger substrate. Subsequently, the choice of which fibre to use to create the filter medium is an optimization exercise that varies between the cut-point and efficiency of the filter, pressure drop and mechanical strength. When the material is weak, but the filtration performance is adequate, the material is usually strengthened through the support of a stronger substrate. However, this comes with an increase in cost that is calculated through per unit of filtration area. Sometimes, this additional cost is unnecessary and it is a wise choice to opt for the filter medium that is tried and tested and offered at competitive prices. As the term suggests, this is the random formation of fibres to create a sheet of paper that functions as an efficient media form. A specific process has to be carried out to support paper for use in wet filtration, without which paper has to be restricted for use in dry filtration. With regard to the cost, paper filters are relatively cheaper than those filters made of other materials. However, the nature of paper media is quite high in its resistance, it does not have an absolute cut-off point, and it also comes with minimal mechanical strength, which serves as a distinct disadvantage for the purpose of filtration. Methods, such as pleating and rigid reinforcement, have shown to be able to reduce the lack of permeability of paper. Therefore, paper filters are usually suited toward ultra-fine filtering processes. With regard to the ease of cleaning paper filters, it is usually easier to clean paper filters used for dry fluids through a backflow, which will blow out the cake that is collected or stuck to the surface. When it comes to wet fluids though, the cleaning process is more complicated and sometimes an absolute clean is virtually impossible. The usual course, when using a paper filter for wet fluids, is to replace the filter once it is clogged. Among the various popular filters, the glass fibre filter is very popular, due to its various advantages over other filters. The filter sheers are created using the same process as paper, but the final product is resistant to the disadvantages of paper filters. There are among the most common filter media materials, made from natural or synthetic materials. Natural sources are from vegetables or animals and the synthetic ones are from glass, ceramic, plastic, etc. They are relatively soft in their characteristic and need a good amount of support before they can be efficiently used as a filter material. They are generally considered as a physically stronger replacement to paper filters but are also strengthened through pleating processes. The larger the size of the filter, the more appropriate it would be to use a fabric filter. Considering the various types of fabrics filters that are available, the advantages and disadvantages are closely related to the specific type of woven fabric being used. Because of their corrosion resistance, ability to withstand vibration fatigue, uniformity and economy to use, they have replaced a number of other types of media. Famous among chemical and industrial use companies, the monofilament fabric comes in a number of polymer filaments (nylon, polyester, polypropylene and fluorocarbon) and is extremely flexible in nature. A combination of mono and multifilament fabric filters comes with additional advantages and thickness. Among non-woven materials, felts use the basic characteristic of the fibre to create mechanical processes, such as needling, which creates a fabric. Due to the nature of weakness of the felt fabric, many felts are infused with a woven material that is buried within the thickness of the material. This is usually a scrim. The structure of felts provides lower resistance as a filter. The process of punching is used to improve the uniformity of the felt. Needle felts are common as bag filters due to their high efficiency. Bonded fabrics, on the other hand, use additional materials to sustain the fibres together and usually they depend upon the thermoplastic nature of the polymer. These are not the traditional fabrics that would come to mind, but rather similarly created sheets and tubes through the use of bonded components (fibres and granules of natural or synthetic materials). Usually, they are coarse and highly porous. The rigid characteristic of this material allows it to be used for filtration processes through sheets or tubes. The main advantage of bonded fabric filters is its ability to function optimally even at very high temperatures. These types of filters are usually produced in sintered form, due to the danger related to materials that escape from the filter medium. These filters come with a high amount of porosity, reduced resistance to flow and an efficient capacity of hold down dirt. The mechanical strength of sintered metal media is around double that of typical powder based media or ceramics or glass fibres. These are made from a combination of glass fibre strands and glass microfibers that form thin sheets. Another absorbent form of this filter is made of carbon fibre, but is more expensive and has a lower performance rate.